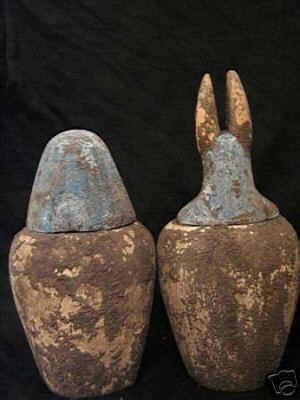 Sold on eBay by seller "U"
The jars were made of several materials such as limestone, calicite or alabaster. 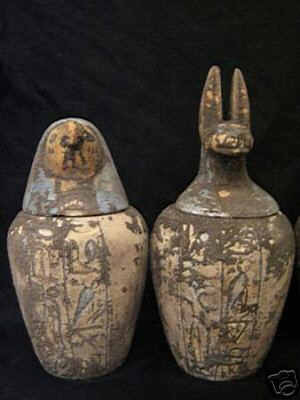 The finishing touch would be the stoppers being shaped like human heads, and later as Jackal, Baboon and Falcon heads. 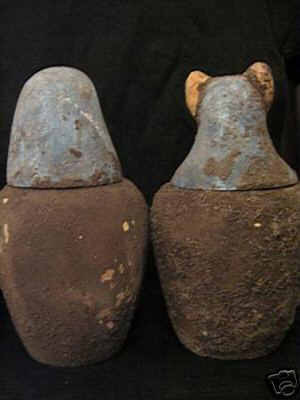 These jars were usually grouped in fours and placed alongside the Sarcophagi, and were supposedly guarded by the Sons of Horus.Imsety the human-headed god looks after the liver.Hapy the baboon-headed god looks after the lungs.Duamutef the jackal-headed god looks after the stomach.Qebehsenuef the falcon-headed god looks after the intestines.Origin: Upper Egypt.21 th Dyansty 1045-994 BC.Hamr STONE.Hight : 17 cm (Each).Width : 8 cm(Each).Our company maintains the most strict of standards in providing the beautiful relics that are pictured in our auction listings. 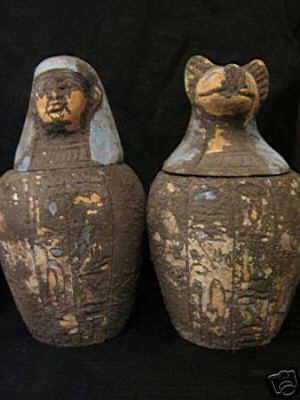 The pleasure of owning these powerful antiquities is known to only the most discriminating of buyers. We search for and buy for you only the finest and most desirable treasures. We purchase from estates, collectors, antique dealers and other established legitimate sources.Our bidders enjoy total privacy bidding, wherein the bidder names are not revealed. 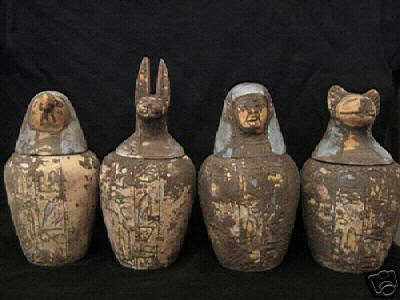 This is primarily a safety measure for you, the bidder, when purchasing high-end antiquities and assures you will not be contacted by others.You may bid with the utmost in confidence that F*****G*** guarantees the authenticity of each and every item. Our photo displays attempt to show the intricate details of glyphs, carvings and features.